Up until recently we’ve had a todo list much longer than any human arms I’ve ever seen. Every week would see us complete one item only to add two more. Todo lists you see, often follow a very accelerated version of Moore’s Law. But we’ve got a secret weapon now: the time to do things (having gone out on our own almost a month ago) and the motivation to (in a very small way) set the world on fire. So today we’d like to show off something that’s been on our todo list since we first released Pocket Weather AU HD for the iPad. Version 1.2 to be precise. 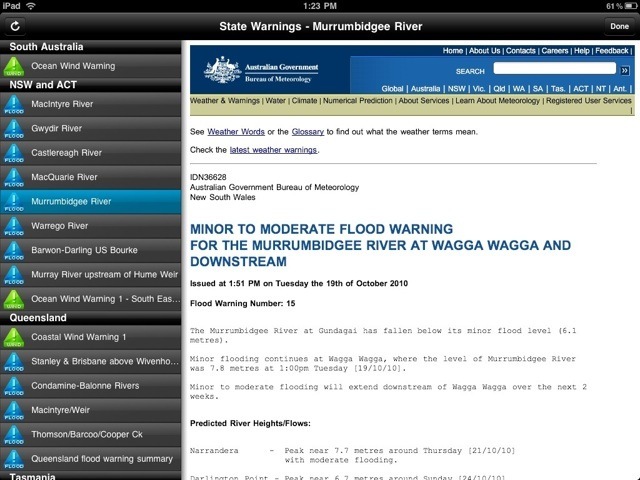 Yes indeedy, you can get your tides, state warnings, detailed forecasts, icons in landscape view and so much more in this new version. At this point we’re providing an intermission for those who don’t care how this stuff is built. Don’t feel bad, the lights are on, we’ll clean up all the popcorn you’ve managed to spill everywhere. Last chance! Now let’s talk about just why this release took so long. We promised that when we went into this full time we’d no longer accept compromise, and we meant it. This version was ‘ready to go to Apple’ 3 weeks ago. In the past it would have been myself, at 1am on my couch looking at things and going ‘close enough’ and pressing the submit to iTunes button. When you’re tired anything that’s working starts to look good. Since then we’ve rewritten the warnings feature twice, the tides three times and played with two different ways of showing you detailed forecasts. After each re-write I’d hand the iPad over to Phil and ask him for feedback. Phil was brutal about everything he didn’t like, which initially made me very defensive, but I’d go and do it because I knew he was right. It was jarring, I wasn’t used to reworking features that worked, and were bug free, with the sole justification being ‘we can do better’. It was also hard to break out of the “we don’t have time for that” mould from our former lives as out of hours developers. After each iteration though we both knew we’d created a better product. 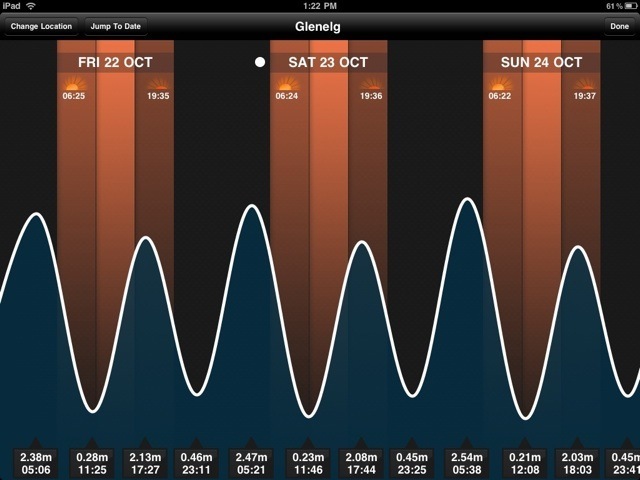 Things you’ll never see like that the initial tides screen having left and right buttons (instead of swipe). Then there was the original detailed forecast design that had the day panels sliding left and right to show more or less content. Don’t even get us started the original warnings screen which had resizable panels of all things. In some cases we re-wrote it because we knew we’d taken shortcuts, other times (like with the slidey detailed forecast panels) we realised we’d gone too far the other way and made something a lot fancier and less intuitive than it could have been. In the end we finally had a version that Phil & I approved of, and one which was much better for the process we’d gone through. Getting things right often means getting things wrong, but being willing to change them. When people look at a final product and estimate the effort required, they’ve left out the biggest component, all the rework and tweaking that led to that final version (common example from stack overflow). 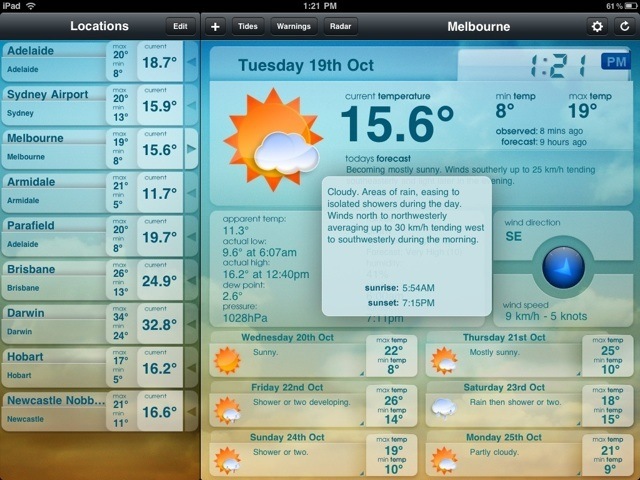 Pocket Weather AU HD is awesome…have you bought it yet? !